Thank you for visiting out page. This campaign has now ended and we would like to say a huge heartfelt thanks for all of the kind donations and messages of support we have received. We cannot thank everyone enough, the support we have received is incredible and we are extremely grateful. The Shah family have released the following statement and have also set up a memorial site for those wishing to leave their thoughts or memories of Asad. "On Thursday evening (24th March), a beloved husband, son, brother and everyone’s friend, Asad Shah, was taken away from us by an incomprehensible act. We are devastated by this loss. 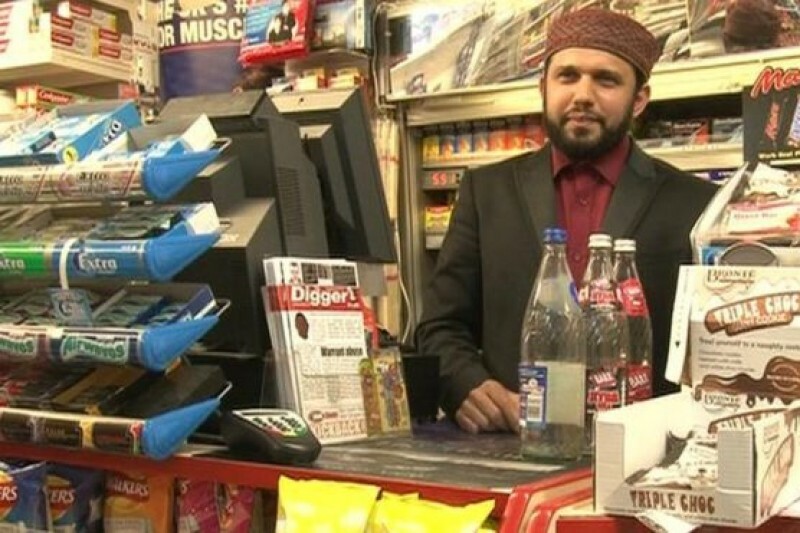 This page has been set up in in support of Asad Shah who was tragically killed outside his shop on Minard Road on Thursday 24 March. This fundraiser has been launched by myself (Jen) and friends (Lauran, Ellanor & Katie) who are all local residents in Shawlands and regular customers of Asad's. As a resident of Waverley Garden's for over 2 years, I personally got to know him whilst visiting his shop on almost a daily basis. Mr Shah was a popular, well respected and much loved member of our commuity and his death has devastated many. He was a warm and friendy man and he always went out of his way to make time to talk to you - he was more than just our local shopkeeper. He was a friend to many. It quickly became clear to us in the aftermath of this tragedy that the people of Shawlands (and wider) were looking for a way to show their support to Asad's family and we thought this would be a fitting way to do so. We are raising funds for his family to use in whatever way they see most fitting - whether that be to contribute towards funeral expenses, provide financial security for his family in the coming months, or simply to do something in his memory. We know money will never make up for his loss but this is our way of showing our support for him, and showing his family how much he was cared for in our commnity. This campaign has now ended and we would like to say a huge heartfelt thanks for all of the kind donations and messages of support we have received. We cannot thank everyone enough, the support we have received is incredible and we are extremely grateful. My sincere condolences to Asad Shah sahib and his family and friends. He showed that the best traits of humanity, kindness, love, and tolerance, unite all decent people, rich or poor, irrespective of their faith. May God bless him and grant solace to his family and friends. May He also bring us to understand that the real division between us is not whether we are Muslim, Jew, Christian, Sikh, Hindu or Atheist, but between: (a) moderate, decent people like Mr Shah; and (b) the extremists of all faiths and none, who would kill a man for the crime of offering a few words of kindness to those who are different to them. Please keep the fund open longer if possible - the least we can do is help towards securing Mr Shah's family's future. Still trying to analyse why I should still be crying and grieving for someone that I only met for some 30 secs to a minute every few months. Very occasionally you meet someone with the face the touch the voice the aura. Mr Shah had that. "My beloved friend." These are the words that Asad Shah used for me. I knew him for many years online. He used to upload videos on YouTube every week, spreading peaceful and loving messages to the whole world. He would also post on Google+ and Facebook, trying to educate people and making them better people. He used to talk about the after life, about heaven, and that we will be there one day if we please God and love humanity. I used to see his face every day when I went online. He was always in the same place, his shop. The words he used to speak, were always pure and loving. He was a role model for me in my life, and I am being 100% honest. Every time I felt I was being some evil person in real life, every time I saw Asad, it reminded me as to who I can be, a better man, a more humble man. Asad was that humble man. He used to contact me with such respect. A man of quality, an angel of light. There are no better words I can say right now for him, my beloved friend. I hate to say this, but now I will never be seeing any new videos from you, or any new messages you post. All of that has now come to an end. I pray to God that He may restore you back to life in the after life, and that you will be rewarded immensely for all the wonderful work you have been doing for the past years. I already miss you. We will meet again, Insha'Allah, God willing. May peace and blessings be upon you, Asad as well as your grieving family. I will remember you everyday, your work is all over the internet, and you will surely be missed. When I first moved in to Waverley Gardens and went into the shop for the first time, we got chatting and he shook my hand to welcome me to the area and asked me where I was living/how the move had been etc. It seems like a lot of people who came into the shop had a similar experience. As an American and a Christian, I mourn the loss of such a wonderful soul to this world. As an American soldier, I have seen the worst humanity has to offer and some of the best, and religion often makes no difference. I spent a good portion of my young adulthood fighting the same kind of men as stole this father and husband from his family. Asad was clearly a wonderful human being and full of a great deal of love and kindness. I hope the small £15 donation is enough to help his family with whatever they need, and pray his children grow up knowing that their father was the kind of man we must all aspire to be; one who loves his fellow man regardless of religion, race or national origin, but simply because they are a person deserving of love. There has been an amazing and heartfelt response to this campaign to raise funds in support of Mr Shah and his family. People from all over the globe have donated and left beautiful comments. wouldn't it be wonderful If they could be published in a book of remembrance dedicated to Mr Shah to celebrate his life and his love for all humanity. This ironic tragedy. The death of a man who loved all, despite religion. Yet murdered, it appears because of it. Feeling both sad and sickened at this mans life being stolen so brutally. May he be numbered among the great saints in Heaven. Asad was one of the most beautiful hearted people you could meet, the number of people at the vigil tonight was not surprising.deeply moved that people who didn't know him are contributing. Our community will never be the same again. Asad was seriously one of the nicest people I have ever met. Always a handshake and a genuine smile from him. He had a gentle way and an aura of peace around him and I am both shocked and very saddened at what has happened to such a lovely kind man. My heart goes out to his family and friends at this very sad time. RIP Asad, you'll be in my thoughts always. My deepest condolences to Asad's family and communities, local and religious. This terrible murder of a truly religious man, who brought light to so many lives must be punished with life, and Asad's legacy must live on. He should be made a saint. People like him will always win over hate and bigotry, no colour or creed could contain his compassion and common sense, no colour or creed can contain the revulsion at his death, and no colour or creed will be able to shelter the perpetrator. R.I.P. a true British gentleman and true Muslim. Not just his family, but his neighbourhood and our country have lost a great and good man. This man has touched the hearts of so many muslims and non muslims alike because he was (a) a good honest friendly person (b) an integrated muslim (c) a hardworking muslim and (d) humble. It seems he was murdered by another so called muslim who travelled from the holy town of thickheads (Bradford). Why this man felt the need to embark on such a journey with the obvious intent to kill such a good human being is beyond me. Was this triggered by his message of happy Easter to his friends and customers or was he fuelled by his intense hatred of the Ahmadiyya community. This community is hardworking, affluent, well integrated and peaceful. By contrast the no doubt sunni "muslim" who ended his life in such a tragic manner is probably a less integrated loser on benefits that will no doubt claim it was his duty to kill a decent human being just because he belonged to a more successful sect then him. The killer deserves the harshest of penalties so that this does not set a precedent within the UK of such killings. This campaign has reached £83k as we speak, something the sunnis did not expect. This killing is not justified and your silence is deafening. Please do not go on about Palestine/Syria etc, you have no right if you are silent about killings on your doorstep, The Sunni community has not openly condemned this attack at all. They have endorsed a killer. Well done. RIP Mr Shah, your are a truly great human being and we do not need the support of the sunni community to recognize this. My thoughts and prayers are with your family. Thank you for your positive contribution to life in the UK.